Tidal Waters Resort with its perfect waterfront location is set amid eight acres of natural lagoons and landscaped gardens. 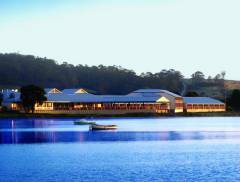 The property features 60 accommodation rooms, two contemporary restaurants and resort facilities that offer a relaxing escape for travellers on Tasmania's East Coast. Wake up and step out onto your own private balcony with views across the bay; watch the fishing fleet come in; swim in the outdoor heated pool; dine al fresco on some of the world's best lobster or sip a glass of wine on the terraced deck. Tidal Waters Resort St Helens is a comfortable 2.5 hour drive from Launceston, offering the perfect getaway for travellers looking to explore the scenic East Coast region. St Helens itself is renowned for fresh succulent seafood, superb game fishing and magnificent sand dunes. The surrounding area features numerous beaches and walking trails ideal for the holiday maker and nature enthusiast. Close by is the awe-inspiring Bay of Fires, with red lichen granite, white sandy beaches and clear turquoise seas, making the area one of Tasmania's most popular tourist destinations.